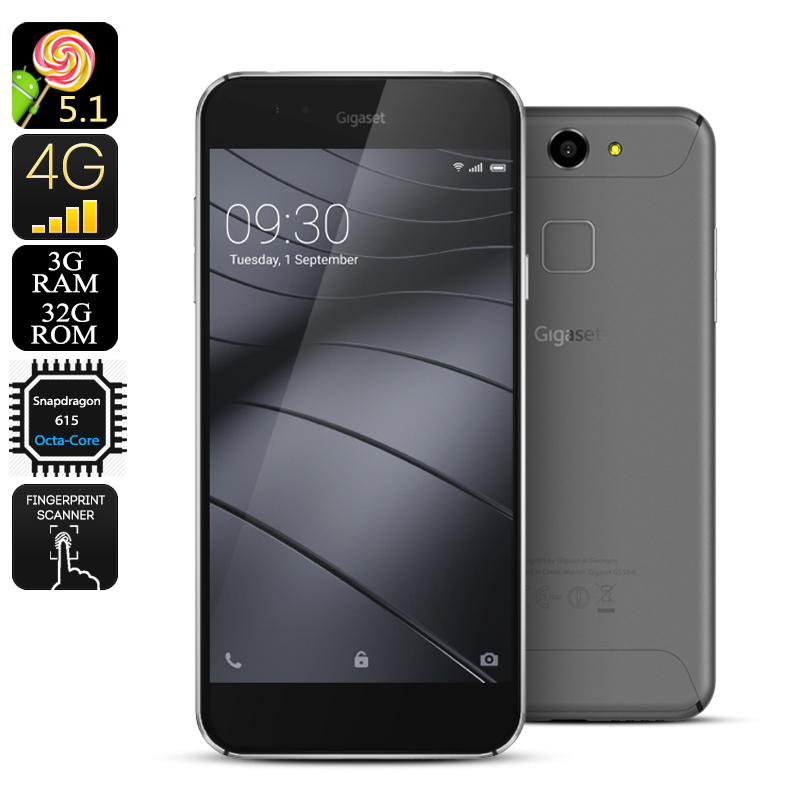 Successfully Added Gigaset Me Pure Android Smartphone - 5 Inch, 1080p, Gorilla Glass, 4G, Snapdragon 615 Octa-Core CPU, 3GB RAM, 3320mAh Battery to your Shopping Cart. Designed in Germany and produced in China – the Gigaset Me Pure is a high-quality smartphone that looks sleek and stylish from the outside yet holds some serious power. Thanks to excellent craftsmanship this Chinese smartphone features rounded edges and has an exceptional look and feel. Its 5 inch 1080p FHD display is made from Gorilla Glass, ensuring that this beauty can take a hit and is capable of dealing with the harsh environment of everyday life. A stylish aluminum casing gives this Android phone a sleek look and keeps its weight to a minimum. Ultra-thin, lightweight, and powerful - the Gigaset Me Pure smartphone is the perfect device for everyday life. Hidden behind its sleek body lays a powerful Qualcomm Snapdragon 615 CPU that, along with the phone’s 3GB of RAM and powerful GPU, produces an exceptionally smooth user experience. Capable of dealing with the most demanding of situations the Gigaset Me Pure smartphone offers the perfect platform for multitasking. Holding a 3320mAh battery this Android phone allows you to enjoy all your favorite apps up to 5 hours usage time without the need to recharge – enough to get through the day without needed to worry about battery life. Enjoy the latest Apps, games, movies, and more with the Google Play store. You will have access to millions of free media files offering days worth of fun and mobile entertainment. Thanks to its Dirac HD Sound and CSR BT transmission technologies, you will always have the best sound experience. Whether you’re enjoying a movie in the train, playing a game at home, or making a business call in the office – with the Gigaset Me Pure smartphone you will always enjoy an exceptional audio quality. Featuring 32GB of internal storage and offering up to 128GB or external storage space this android smartphone offers an ocean of space to store all your important files. On the rear of this Chinese smartphone you find an ultra-fast fingerprint scanner that helps you to secure your phone along with all its data. This state of the art fingerprint scanner can do a lot more than simply secure your phone. With the Gigaset Me Pure smartphone you will be able to program your fingerprint scanner as to answer calls, take pictures, and encrypt files with just a simple touch of a finger. The Gigaset Me Pure comes with a 12 months warranty, brought to you by the leader in Android Smartphones as well as wholesale electronic gadgets..
Arabic: - الهاتف الذكي 5 بوصة - Chinese Simplified: - 5 英寸智能手机 - Czech: - 5palcový Smartphone - Dutch: - 5 inch Smartphone - French: - 5 pouces Smartphone - German: - 5-Zoll-Smartphone - Hebrew: - החכם 5 אינץ ' - Hindi: - 5 इंच स्मार्टफोन - Hungarian: - 5 colos okostelefon - Italian: - Smartphone da 5 pollici - Japanese: - 5 インチ スマート フォン - Korean: - 5 인치 스마트폰 - Malay: - Telefon pintar 5 inci - Norwegian Bokmål: - 5 tommer Smartphone - Romanian: - Smartphone de 5 inch - Russian: - 5-дюймовый смартфон - Spanish: - Smartphone 5 pulgadas - Thai: - สมาร์ทโฟน 5 นิ้ว - Turkish: - 5 inç Smartphone - Vietnamese: - 5 Inch Smartphone.